Rainfastness of crop protection products is one of the more frequent phone calls I receive. It is often because growers are applying products shortly before periods of rain to protect their crops against diseases, and frequently the rain comes either before they finish spraying or shortly after they have put the boom away. 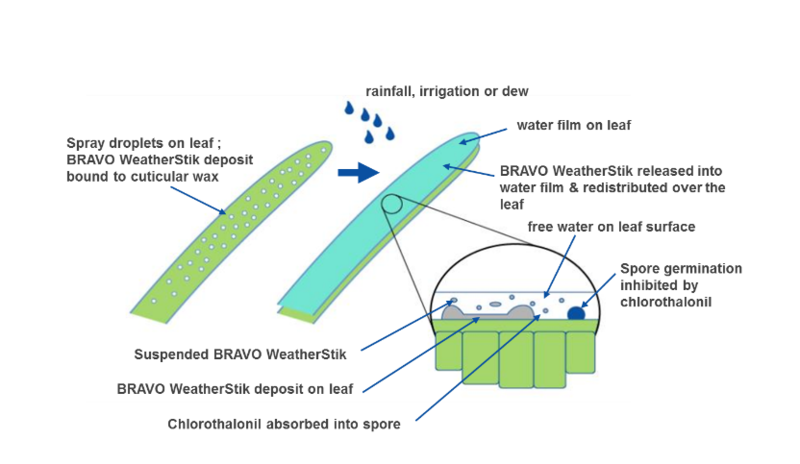 What is the rainfast period of a crop protection product? I like to refer to the rainfast period of a crop protection product as the time period after application at which rainfall or irrigation has the least impact on the performance of the product. For example with protectant fungicides like mancozeb / copper it is generally when the spray deposits have dried, or with a product like SCORE® Foliar Fungicide it is when the active ingredient has absorbed into the plant and cannot be washed off. What factors can impact the rainfast period of a crop protection product? The time after the application when the rainfall occurs. For some products this time period will be stated on the label, e.g. SCORE label states: The effect of SCORE could be diminished if rain falls within 2 hours of application. If you are unable to find any reference on the label to the rainfast period contact your chemical reseller. If you still cannot find the answer, a good general rule is that a period of 3 to 6 hours without rain after an application is needed for systemic fungicides to penetrate the leaf tissues and for protectant fungicides to stick to leaf surface. As normal you should always check the product label for full direction of use. The intensity of the rainfall, not necessarily the duration of the rainfall event, is another factor. For example some fungicides like chorothalonil (e.g. BRAVO® WEATHERSTIK®) and azoxystrobin (e.g. AMISTAR®) may actually benefit from light rain (rainfall that does not result in droplets running off the plant) by improving the redistribution of the fungicide over more of the plant surface. If the rainfall event, however, is heavy enough to cause the droplets to wash off the plant before the product is considered rainfast, it is likely to reduce the performance of the product. Do spray adjuvants improve the rainfastness of crop protection products? The use of spray adjuvants can certainly improve the rainfastness of crop protection products, particularly those products designed to improve the retention, penetration or spread across the plant surface. It is important to note that you should only add an adjuvant to a crop protection product when the label expressly tells you to do so. Adding an adjuvant when not directed could potentially reduce the rainfastness of a crop protection product and its performance.